Mrs. Mary E. (Collins) Bergin of 75 Lincoln Street, Hartford, was born in April, 1872 in Ireland*, daughter of Mr. and Mrs. Collins. She was found dead at the circus grounds after the fire on July 6, and was buried at Mt. St. Benedict Cemetery in Bloomfield after services at the Ahern Funeral Home. 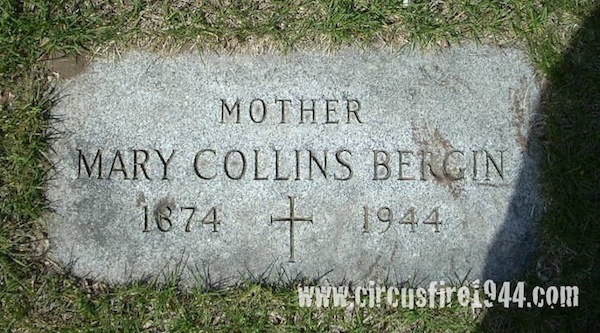 Mrs. Bergin's daughter, Miss Mary F. Bergin was also a victim of the circus fire. Mary E. leaves her husband, John Bergin, who would join his wife and daughter in eternal rest just two months later on September 7, 1944. The body of Mary E. Bergin was identified on Friday, July 7. Her estate was awarded $4,000 by the arbitration board. *1940 census shows Mary to be age 75 (in 1940) and born in NY; 1930 census shows Mary to be 65 (in 1930) and bornconflict with Death Certificate which states age 70 (in 1944) and born in Ireland. Gravestone shows age 70 at death. Mary's footstone at Mt. St. Benedict Cemetery.